Set of 4 wheels 15" - "Aero 92"
Set of 4 wheels "Aero 92". 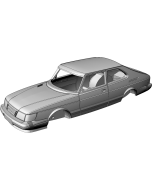 This is a scale model of 15" alloy wheels for Saab 900 - "Aero 92". Exactly as real "Aero 92" assymetric wheels these comes in pairs - 2 right and 2 left wheels.